Fritzle Teddy Bear by Steiff. This beautiful limited edition piece in light beige mohair, is fully jointed, carries the white ear tag, which signifies it as a Steiff limited edition and wears the famous gold plated button in ear, Limited edition of only 1880 pieces worldwide. Product details: safety eyes, synthetic filling material, non growler, total size 28cm. Comes boxed, together with a numbered certificate of authenticity. It was 135 years ago that Fritz Steiff paved the way for his sister Margarete to become one of the finest toy makers in the world. The master builder gave her motivation, later selling Margarete´s "little elephant" at the Christmas market in Heidenheim. Without his initiative, his skill, things might have been very different... With Fritzle Teddy bear, we pay homage to Fritz Steiff. 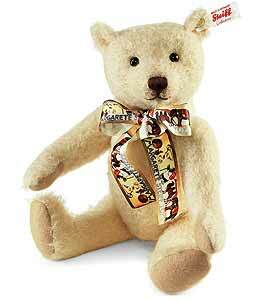 The 28 cm tall bear in the finest, light beige mohair is very proud to wear a very special satin ribbon. The ribbon is printed with a very famous Steiff advertising design used in the early 1900s which received enormous applause from the Toy Industry. Skilful hand airbrushing enhances the "aged" look of this important little bear who is made in a limited edition of 1,880 pieces - symbolic of the big year... Fritzle means a lot to us.